Freedom Alert is a personal emergency response system (PERS) with a two way voice pendant that allows the user to immediately call for help if they have fallen and can't get up, or are in need of assistance. Freedom Alert provides protection with no monthly or additional fees. All that is needed is the Freedom Alert system and a phone line. The included two way voice pendant can be worn around the neck, in a belt clip, or attached with a wrist or wheelchair strap (included). 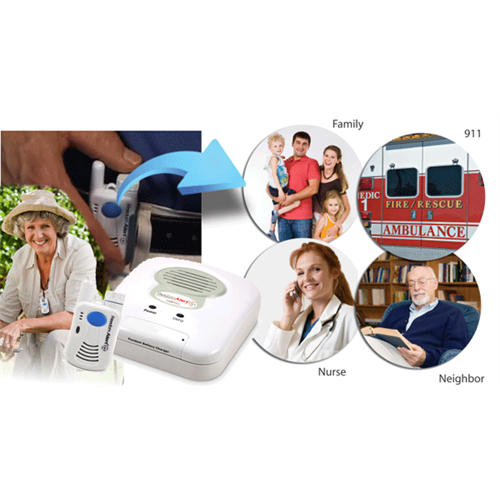 Freedom Alert is perfect for older adults, phsyically disabled or anyone at risk, in a private residence, nursing home or elder care facility. What makes it different than most other products use the base station as a speaker phone, so if the user is away from the base they can't have a conversation. 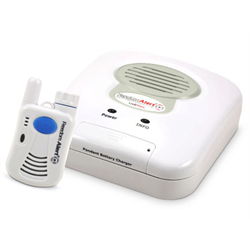 Freedom Alert uses the pendant (or optional emergency help button) for two way voice calls so the user is protected wherever they go in or around the home without having to shout to a base station in another location. How does it work? The base station connects to a wall outlet and telephone line connection. 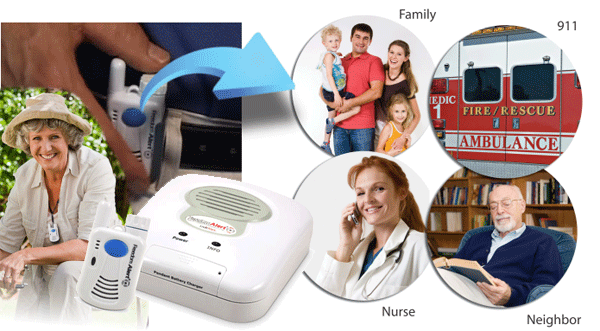 The system is initially programmed using a regular house phone with up to 4 personal contacts and/or 911. When the button on the wireless Freedom Alert pendant is pressed, the first person in the list is called and when they answer, they can have a two way conversation with the user. If the first person doesn't answer or an answering machine is reached, the next person is called and if no-one answers, the system can be programmed to repeat - or call 911 directly. The pendant operates on a rechargeable lithium battery that can be recharged by the base unit and lasts up to 6 months. An emergency wall communicator can be installed in strategic locations and up to 4 units - pendants or wall communicators, can be programmed to the base. Calls up to 4 personal contacts and/or 911using a standard phone line. Compatible with most VOIP lines as well. Wireless Range: 600ft (183m) line of site. Note this is a maximum out in a field. Interference or obstructions will reduce range. This product is designed to easily cover a standard home inside and outside front/back yards. 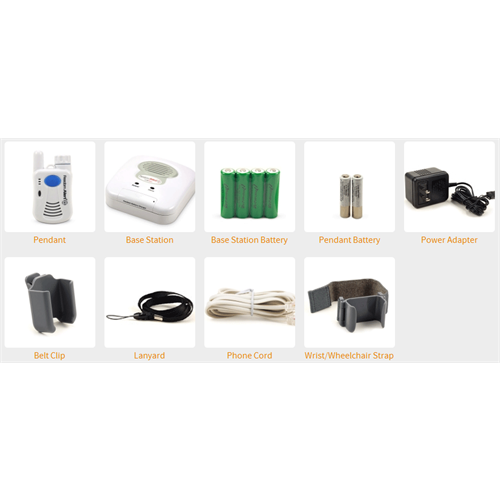 Kit includes 2 rechargeable batteries for the pendant (replacement part LOM-35917) and 4 rechargeable batteries for the base (replacement part# LOM-35918), available from Aartech or Logicmark distributors and dealers. Pendant: 1.4oz – 41g (w/ battery) L: 2.13" (body) 3" (w/ antenna) W: 1.25" D: .75"